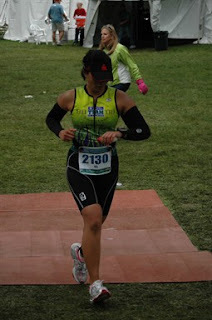 One week later..I can recount all the funny things and thoughts that happened during the race! First of all, thank you to friends for your support and encouragement! It really means a lot and I am truly grateful for it. 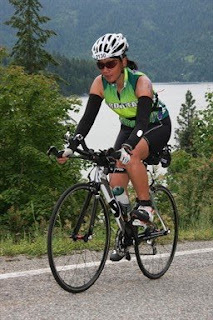 While not many people I know would think of taking on the challenge of an Ironman distance race, my heart smiles every time I get an email from a friend to tell me that they're attempting their first triathlon, whether it'd be a sprint distance or an olympic. Many people have said that I've been too hard on myself for what I thought to be a disappointing race..my thoughts on my race have not changed however I have gotten over it and am ready to move on! Below are a few pictures from race day! 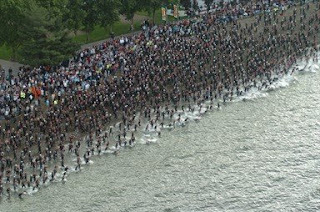 First one below is an aerial shot of the swim start. The picture of the mass swim start of 2,166 athletes (2,035 finished). I've decided that the swim is really where I need to make big improvements on before my next Ironman! I've also communicated this with Coach..we'll see what he says but I have a feeling that he will agree. He once said that the swim was my biggest limiter. I didn't know what he meant at the time because I figured the swim was the shortest part, therefore least important but during the race, I had an epiphany, he was right! I will elaborate more on this later on, maybe when I get into the thick of things next season :-). Before the start, I am chatting with Coach and he mentions that he would love to be a guide for a challenged athlete which i think would be awesome but the conversation itself was a bit amusing. Coach, "Yeah..I think I can slow my pace down a little to guide a challenged athlete." Me.. confused look which consists of head tilting to the left and scrunched eyebrows thinking, "You? Slow your pace down? Hm." It would be a very awesome thing for Coach to do though!! The picture below is during the bike leg. I don't know what mile as I wasn't aware the photographer was there. So the thing with the bike is..I'm not supposed to get off... ever during the race especially when it comes to pee'ing. "You don't get off the bike to pee." says Coach. I've done a great job of following that direction at Oceanside 70.3 and Wildflower but last Sunday, I had to get off because I simply couldn't relax enough to go on the bike and I really couldn't pass up the offer of this couple out on the course. This lovely couple has set up a station in front of their house on the bike course. They had a table of tools and two large signs- "bike help" and "bathroom" ...heck yea bathroom!!! Ha ha. The support from the CDA community was truly amazing! The run during the Ironman is always special. It's where you're trying to gut it out to get to the finish. It's also where you start to meet friends...your fellow Ironman athletes who you started at 7am with. The highs and lows you go through during the run is not something one can describe...it's just meant to be experienced. 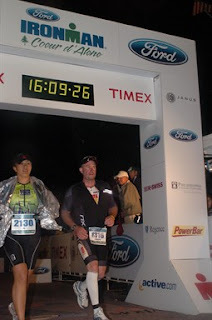 Last year, at IM Loo, I did the entire marathon on flat coke, water and bananas. This year, at IM CDA, I wanted nothing to do with the flat coke but I welcomed the warm chicken broth and pretzels! The Ironman is a really funny guy who likes to screw with you during the race. I was in no mood or shape to run but everytime I passed by the Ford Motivational mile, my favorite song to run to- Infinity 2008 by Guru Josh Project- was playing, WTF Ironman? First, you take the functions of my heart rate monitor and now you're mocking me- thanks! The finish line...with the voice of Mike Reilly is something that every Ironman athlete looks forward to! The guy in my finish photo, that's Joe. I met him at around mile 21. We agreed that we should just run into the finish shoot together and not try to out do eachother.. afterall.. it's the 16th hour.. how much sense would that make?! Ha ha. I held on for 16 hours and below is what I get.. a heater would have been nice and a big hot cup of cocoa! And why does the medal look like a Christmas tree? So it's Wednesday, Mary, Eric and I were at the Spokane Airport enroute to home. Going through security, they took my little Swiss Army knife. I was quite peeved as I've traveled with it for years and have had no problems but leave it to the little airports to think it was an issue! While sitting by the gate, Eric gets paged to the ticket counter though we didn't think it was a big deal, his bag was probably just too heavy. As I sit there still ranting about my knife incident to Mary, Eric comes back and says, "They're reporting me to the FAA for my CO2 cartridges." Mary and I bursted out laughing so hard that we could barely breathe. And at last, I leave you with the link the Ironman Coeur d'Alene race highlight video featuring yours truly about 5 minutes and 49 seconds in. My friends Kara and Brian are also in it about 8 and a half minutes in. Good stuff! !